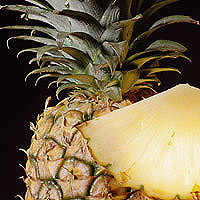 Fresh pineapple is available all year, peaking from March until the end of July. Slice off the top and bottom to steady the fruit, then with a sharp knife shave off the spiked skin. To remove core, slice off sweet flesh right along edge of core. Spruce up savory dishes by giving pineapple a quick grill. Simply add to grill, turn once, and serve as a garnish on meat, poultry, fish, or with other grilled vegetables. Pineapples are an excellent source of vitamin C.